The friendly folks over at ProCopywriters have just published a new interview with me – part of their series of revisited spotlights that’s definitely worth a read. I’m a copywriter. I’m freelance. I’m all for fair rates for good work. But I’m also a human being. So I’m dead against grown adults acting like little babies. So, I haven’t been the world’s best blogger lately. In fact, I haven’t posted for what seems like an age. There’s only one person to blame. Wait, no. It’s not me! No, I’m innocent in all this. The only person to blame is you. If you’re a client, you’ve taken up my time with, you know, writing copy. Copywriting. You should be ashamed. But I’m not writing this to diss you on the internet. I’m writing this to say thanks. Because it made me realise something quite useful. Nobody’s asked, but you might be wondering why I keep stating the obvious. Well, when I wrote Four Obvious Things About Copywriting, it was because these were things people sometimes seemed to forget. The very basics of copywriting. The things you know instinctively, automatically, and from the moment you write your first piece. But they do help sell things. Which is good. Now, I’ve decided to state some obvious things about running your business. 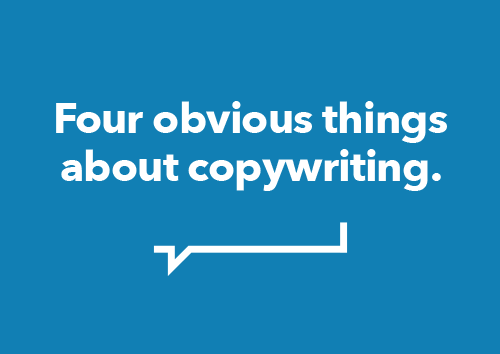 You can read Four Obvious Things About Running a Copywriting Business as a guest post over at Copywriter Collective. A free downloadable guide to copywriting basics for beginners. And a reminder for those of us that should know better.